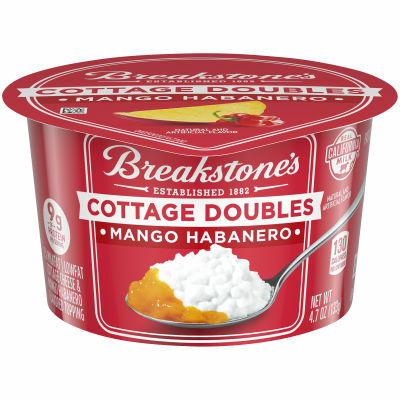 Cottage Doubles Mango Habanero Cottage Cheese - Breakstone’s Cottage Doubles Mango Habanero Cottage Cheese is a healthy and delectable treat that will satisfy all your cravings. Breakstone’s creamy cottage cheese is mixed with a sweet and spicy mango habanero topping to create a mouth-watering flavor combination. - A Satisfying Treat - Indulge your cravings without compromising your diet with Breakstone’s Cottage Doubles. Creamy cottage cheese and a sweet and spicy mango habanero topping create the perfect treat that will make you forget you’re on a diet.